What makes art activist? What makes it political? Does who is using it matter? The Interference Archive is uniquely situated as both a living collection of activist cultures and ideas, and a site of popular education and engagement with these ideas. One way we integrate these facets is by offering lectures/tours/workshops to groups and classes. 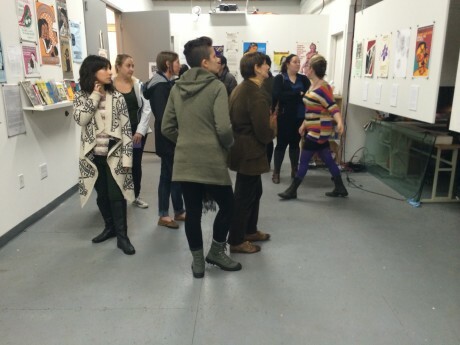 I recently taught an interactive workshop on activist printmaking and political art at the Interference Archive, where I currently volunteer on the cataloging team and work on my political art research as the Resident Scholar. For the workshop, in order to reflect the content of the class who was visiting, I wanted to highlight feminist printmakers who create paper-based works that support both global and local liberation projects. I also wanted to select works that have an activist lens which encompassed the struggles and experiences of women of color and allies. What makes a print political? Why would we call this poster “activist”? What are the determining factors to call this “art” and what kind of art? Are all prints in some way activist because of the history? Political art can thus be understood one way as the non-neutral strategy of using visual culture within social and protest movements to achieve certain ends. This makes it teleological, or goal-oriented, in its messaging. This is the “activist” part — some effect, or utility, is hoped-for in producing it. So, looking back to posters: why would we call them activist? If they are part of a conversation which includes a call to action. For political posters, this call to action is non-market based, and can come from a cultural or moral imperative rather than a call-to-action that comes from a shopping imperative. Because political/activist art is both by and about utility as well as politics, and communities as well as activists, it’s inherently tied in to the people making it and the intended audiences for it. The individuals and groups who make this kind of cultural production are primarily movement actors [e.g. activists] within the communities meant to experience and co-create the work, artists, cultural activists, tool-having professionals, also often from within the communities of interest. These groups are far from mutually exclusive and often involve a lot of cross-over. Political art is criticized for being too didactic, that is too blatant, loud, or uncrafty about it’s intentions. 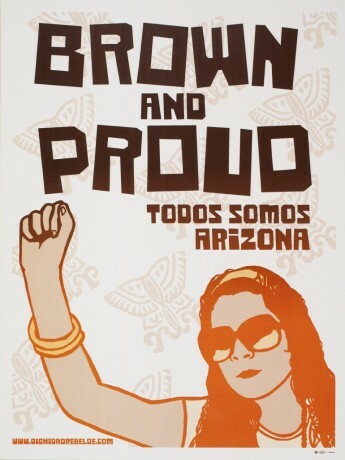 But, if we see it as visual culture, as part of a conversation, then we can allow it to intentionally make a point: for example, to be Brown and Proud is a good thing. It’s also criticized for lacking effect in lieu of more “direct” activist tactics. While we can also not assume that the creation of any revolutionary cultural item is enough to incite revolution, it’s also unfair to assume that the production of something that of revolutionary cultural voice is a failure. Most political art does not have a set space for responses, as in the gallery settings which fine art does, or in the market reports which commercial art generates. To review, I think the factors that define political art are effect/utility in the message, awareness of politics in the production, and community engagement or voice. What do you think? What else is there to consider? Who else is talking about this work in ways you want to engage with? by appointment for individuals and classes to get customized tours. Event listings and more are at: www.interferencearchive.org, or email interferencearchive [at] gmail.com to book your class visit. *Check out Paper Politics, Post-Digital Print [PDF], or this interview with historian Lincoln Cushing for some of that history. Art Journal, V 63 N1 Spring 2004 pp 38 – 40 http://www.jstor.org/stable/4134473. p39.